These large commercial air vents are great to use in grid ceilings since they just drop into place. The drop ceiling vent has an overall faceplate measurement of 23.75 x 23.75 inches and does not require any mounting hardware when installing. Our commercial air vents are made from a steel construction and have a formed steel back panel. The drop ceiling vent has a duct collar that is 2 inches high and is available in 6 inch, 8 inch, 10 inch, 12 inch and 14 inch in diameter. This collar would simply slip into your ceilings duct work. Our commercial air vents provide your space with a 360 degree airflow since air diffuses from all four sides. The drop ceiling vent allows for high air volume delivery since it does not come with a damper. Purchase the commercial air vents butterfly damper separately in order to open and close off airflow with the removable handle. 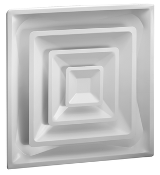 These drop ceiling vents have a bright white enamel finish that will work well in any restaurant, hotel or classroom. Important: These drop ceiling vents are typically in stock but availability is subject to change. 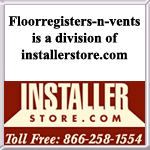 If the commercial air vents are not in stock, lead time can be approximately 2 to 3 weeks to ship. Purchase insulated drop ceiling vents for your commercial location to save money on heating bills. Our commercial air vents are well built and will keep a constant air flow throughout your room. Order today! Szie 6" 8" 10" 12" 14"